A little extrapolation of U.S. Census data, I told them, shows the American population hitting 518 million at mid-century and 758 million in 2100. The world’s population is likely to grow to 14 billion at century’s end. Imagine what that world — their world — would be like, I challenged them. From hog slop to White House? Despite one presidential candidate’s proclamation that hope is nigh, little appears visible. Pennsylvania votes Wednesday in what reasonable people might wish is effectively the last of a primary season in which presidential aspirants have effectively revealed their character by tearing down each other to become the last man or woman standing. That intent is much of the content of their words, ads and deeds. Why should voters value destructive behavior? Why should voters value stridency? Why should voters value the invective that candidates (and their side men and women) throw at each other with such little concern for accuracy? On Jan. 1, Federal Election Commission records show, Rep. Thomas M. Reynolds (R-N.Y.) had $862,809.75 in his campaign operation, Reynolds For Congress. From Jan. 1 to March 31, FEC records show, he raised $271,851.79. Allowing for spending by his campaign ($123,825.39), Rep. Reynolds finished the first quarter with $1,010,835.55. That’s a nice piece of change for a Republican incumbent to take on any challengers, eh? While there is always more to do, elected officials are only temporary stewards of the people’s trust. That’s why today I am announcing that I will not seek and be a candidate for reelection. Now that Rep. Reynolds won’t be a steward of the public’s trust, what kind of a steward will he be of the million bucks of other people’s money tucked away in his campaign fund? NYT’s 1Q profit bombs: Now what? In the first quarter a year ago, The New York Times Co. made $23.9 million in profit. This week, the company reported a loss of $335,000. That’s about the worst quarter-to-quarter loss the company — and the news biz — has ever seen. 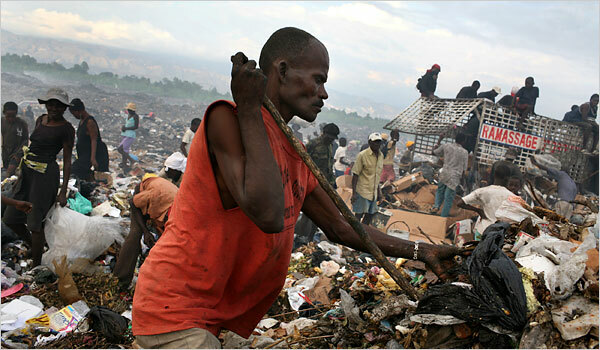 In a garbage dump in Haiti, people scavenge for food. They look at me and say, ‘Papa, I’m hungry,’ and I have to look away. It’s humiliating and it makes you angry. — Saint Louis Meriska of Port-Au-Prince, Haiti, whose “children ate two spoonfuls of rice apiece as their only meal recently and then went without any food the following day”; food prices in Haiti have spiked 45 percent since 2006; April 18. Has the financial tipping point of life vs. death finally arrived? Do you now need to be financially healthy (meaning rich) to ease suffering from or survive diseases such as multiple sclerosis, rheumatoid arthritis, hemophilia, hepatitis C and some cancers (such as metastatic breast cancer)? This is actually a boost to remind people that we can produce this kind of journalism at any time. We’re going to have a large enough newsroom to continue to produce this kind of quality journalism. — Leonard Downie Jr., editor of The Washington Post, winner of six Pulitzer Prizes for 2008; The Post‘s front-page story by media critic Howard Kurtz did not mention the paper has endured three rounds of staff cuts since 2003, but the AP’s story did; April 7; emphasis added. I can only confirm that the route is dynamic. — Nathan Ballard, a San Francisco city spokesman, as, said The New York Times, “The precise route remained in flux on Tuesday as the torch extravaganza threatened to become more civic migraine than celebration in the face of potential protests by those upset with China’s human rights record and recent crackdown in Tibet”; April 9.